Unlike some other paths along the Glacier Point Road, the Mono Meadow Trail does not pass any spectacular scenery, instead encountering wooded, gently hilly land for most of its 5 mile length. The path is used either by backpackers heading for the southern Yosemite wilderness, or those hiking to the meadow, which is just 0.6 miles from the highway. Visitation is generally light so the meadow and the surrounding forest can be a good place to look for wildlife, including bears. The trailhead, also a picnic area, is beside the road just as it curves round due north, a point 10 miles from CA 41 at Chinquapin Junction. The path heads straight down a steepish hillside, descending 300 feet through sparse forest of well established pine trees, some damaged by fire, and then turns round to the east, across flatter land. The meadow is visible to the right through a belt of younger, more dense woodland - the main part is mostly out of sight though easily reachable by a short walk through the trees. The path crosses a smaller open area north of the main grassland, over a small marshy stream and past a few bushes & downed trees. 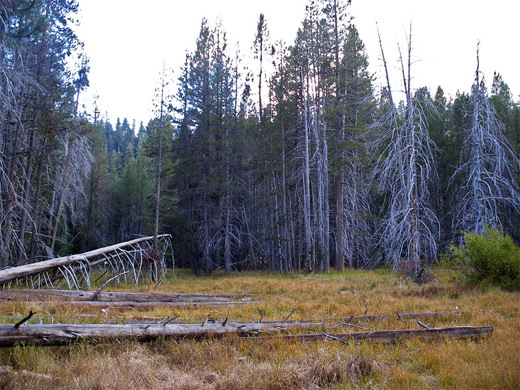 All of the meadow is lined by other dead trees, some ready to fall. After the meadow, the ground is nearly level for a mile, before a second stream crossing and a gradual ascent, now over more exposed land with patches of granite and views over far-away mountains including the Clark Range and Mount Starr King,. The path descends more steeply on the far side of a ridge, down to Illilouette Creek and a junction with the Buena Vista Trail - left is 2 miles to the Panorama Trail while right reaches Buena Vista Peak after 8 miles. The Mono Meadow Trail continues another 2 miles, up an sunny hillside on the east side of Illilouette Creek to a junction with the Panorama Trail just above its descent to the Merced River.